This post may contain affiliate links, which means I make a small commission when you click on the link and make a purchase. You can read my full disclosure here. Website hosting is the “house” where your website lives. You purchase hosting and that host company stores your website on their servers. You can “rent” website space from a company like Wix or Blogger, but this is not recommended because you do not own your website. You are also very limited with your customization and monetization options, which makes it hard to grow and make money. It’s much better to own your website and have FULL CONTROL of your customization, monetization, and growth. And the only way to own your website and have full control of it, is to use a self-hosted WordPress .org site. Once you have decided that a self-hosted website is the best route for you, you’ll need to purchase hosting. I use and love Siteground, and they are highly recommended in the blogging community. Today, I’m going to share some top secret info that will help you save money on website hosting through Siteground! People always say that purchasing hosting for your blog is super affordable, right? Usually just a few bucks a month. But, what they don’t tell you, is that after that “introductory period” is over, your monthly price more than doubles. That’s not a huge deal to some people, but most of us are trying to be smart spenders and make our blogging investments COUNT. So, here’s my secret weapon for saving money on website hosting: when you buy hosting through Siteground, you are locked in at that SUPER LOW introductory price for all the years you purchase up front. So, take advantage of that special offer, and purchase several years up front! If you buy (1) year of hosting on their start-up plan, it costs $47.40 for the first year. Sweet, right? Super affordable. But when your hosting renewal comes around, that price goes up to $143.40/year. Again, not a huge deal for some people, but who wants to pay triple the price for no reason?? Not me! Yes, you read that right. Purchasing (3) years of hosting in advance will cost you LESS than one year of hosting after your introductory period is over. That’s the kinda math this girl likes to do. WHY SHOULD I BUY 3 YEARS OF HOSTING UP FRONT? Website hosting is an essential part of your blogging business. It allows you to own your site and allows you to use the fully customizable WordPress .org platform FOR FREE. Yes, when you purchase website hosting through Siteground, you get to download WordPress .org with their simple 1-click installation. Unfortunately, I encounter soooo many new bloggers on a daily basis that are frustrated that they learned about this too late. They usually outgrow those “rented space” platforms like Wix and Blogger and end up switching to self-hosted WordPress anyway. Some of them upgrade to premium services on rented space platforms, like WordPress .com, and then realize that it’s ACTUALLY CHEAPER to get hosting and own your own website. When it comes down to it, you’re going to need website hosting for your blog anyway. It’s well worth the investment to spend $142 and get 3 years of hosting at a steep discount! Remember, if you buy one year at a time, your annual price goes up after the introductory period, and you end up spending more money on ONE SINGLE YEAR of hosting than you will spend on THREE YEARS of hosting if you purchase it up front. It just saves you sooo much money! I wish every new blogger knew this little trick before purchasing hosting. I’m hoping my little soapbox spiel over here has convinced you to take the plunge and purchase as many years of hosting as possible, UP FRONT. I’m not gonna lie, I only purchased (2) years of hosting up front and I regret it. I didn’t know about this little money-saving trick back then because nobody talks about it. And I’m changing that today. I’m talking about it. 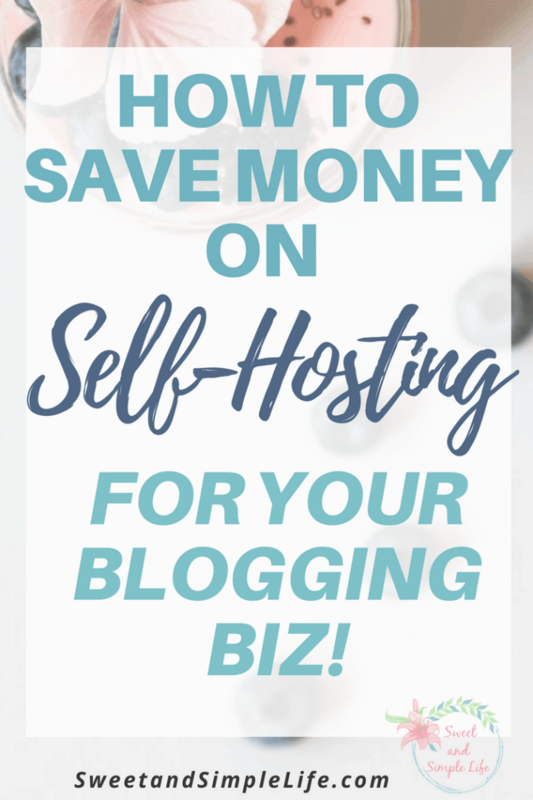 I don’t get anything extra by telling you to purchase more years in advance, I just genuinely want to help you save some money on your blogging business! Use my secret weapon to save money on website hosting and sign up with Siteground today. You can sign up for hosting here! Please share this article with your blogging friends and in your Facebook business groups, spread the word and help your fellow bloggers save some moolah. Great post and I wish I would have read this months ago lol! Lesson learned! Me too girl, meeee too! Please share this article and spread the word for other bloggers, hopefully it helps someone else before they get started! Thanks for the info Cate. I paid $71.4 for multiple hosting which is expiring this month and I didn’t really utilize it due to work constraints. Now, I am ready to take a full plunge into freelancing and siteground sent me a mail of $240 annual renewal. I can’t pay that for a year, the increment is way too much and by a stroke of grace I stumbled on your post today. My question is, should I just let my subscription expire and subscribe newly with the same $240 for 3 years? Your expert advice is needed, many thanks. God bless you for this insightful post.